Choosing the perfect wedding band is a very personal process. A wedding band is more than just another ring; it’s a symbol of promises, love and commitment. It’s also the one piece of jewelry you will wear throughout your entire life – every year, every month, every week, and every day. Because of these factors, a wedding band should be chosen carefully. The wedding bands a couple inevitably chooses reflect who they are and what style they like. Apples of Gold carries an extensive selection of quality wedding bands so couples have many handsome options to choose from. Besides traditional white and yellow gold wedding bands, we also carry many gorgeous rose gold wedding bands. Though rose gold wasn’t widely used for the past few decades, it has recently made a big comeback in jewelry use. Couples who choose rose gold rings appreciate a bold, unique look that stands the test of time. Rose gold wedding band designs range from the very simple to extremely elaborate, allowing couples to further personalize their wedding bands to their taste. Below is a small sample of our beautiful selection of rose gold wedding bands. If you don’t spot one you like, make sure to click over to our full selection of rose gold bands. 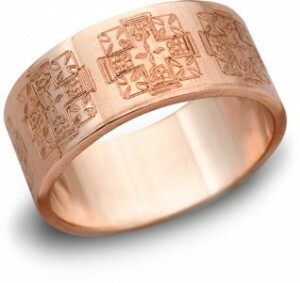 Many of the bands are stylish enough that you might want to buy one to wear as a regular ring! Many couples love the contemporary, organic feel of hammered gold. This ring (picture at top) is incredibly unique; it isn’t often that rose gold bands can be found with the eye-catching hammered texture. Despite its unique texture, this ring is not flashy and is just different enough to stand out. One romantic way to make your wedding bands unique is to include a word, date, phrase or part of your wedding vows as an engraving on the ring. Our personalized rose gold ring takes it one step further by allowing the engraving to be etched on in your own handwriting. Simply send a JPEG with what you want written on the inside of the band and it will be memorialized in your own lettering. 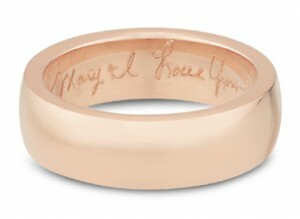 Alternately, the words can also be engraved on the outside of the ring to show your love to the world. 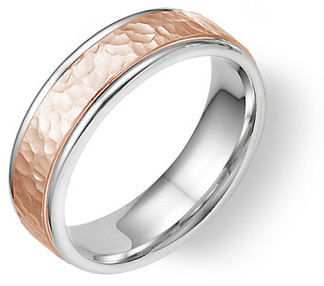 Along with the simple, quiet designs are many striking, bold rose gold wedding rings. 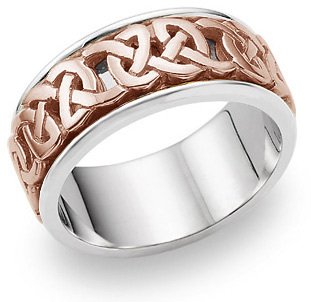 The options range from a twisting Celtic Heart Knot design to bands engraved with the intricate Jerusalem Cross to swirling Paisley designs engraved with care and craftsmanship. These are just a small sampling of the many beautiful rose gold designs we offer to couples looking for the perfect wedding band. Visit our wedding band section for more handsome designs in rose, white and yellow gold, and good luck in finding the ideal band for you and your loved one.